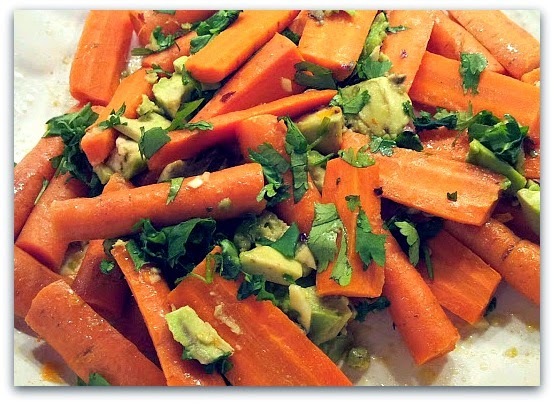 Carrots and avocado are a wonderful combination as this dish proves. I think I will add the recipe to my Thanksgiving menu. 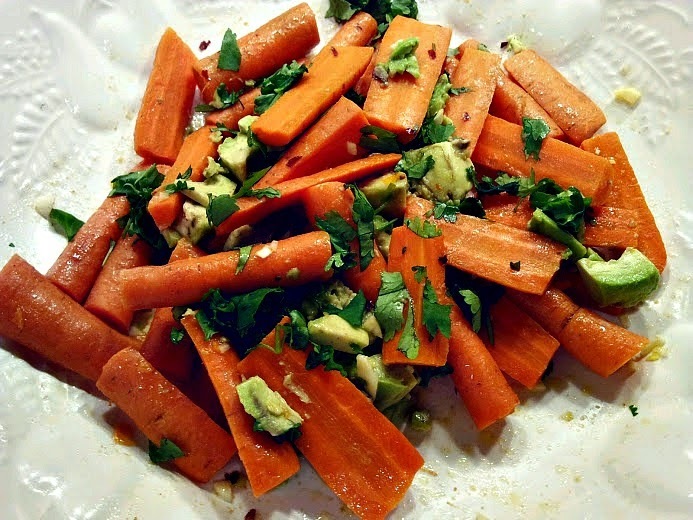 The carrots are crisp-tender, the avocado smooth and creamy, the lemon-olive oil vinaigrette light with a touch of spice; perfect to balance out the richness from the rest of the meal. Best of all, in my opinion, this easy make-ahead dish should be served at room temperature freeing up your stove, oven and refrigerator for the rest of the traditional feast. Well, actually, best of all is the carrots are absolutely delicious. Enjoy! Cut carrots into 3-inch long pieces, then cut into 1/2 pieces in diameter. Add carrots and 1/2 cup water to medium sized saucepan. Add 1 teaspoon sea salt. Bring to a boil, reduce heat to medium-high and cover. Cook until carrots are crisp-tender (7-8 minutes). Pour into strainer to drain off all the liquid. Set aside. Add lemon juice, olive oil, garlic, cumin and pepper flakes to a large bowl. Whisk together until combined. Stir in warm carrots ensuring they are well coated. Allow to come to room temperature. (can be made 1 hour ahead). When ready to serve, stir in avocado and cilantro. Season to taste and serve immediately. It is "Carrots" week at Food Network's Fall Fest roundup. 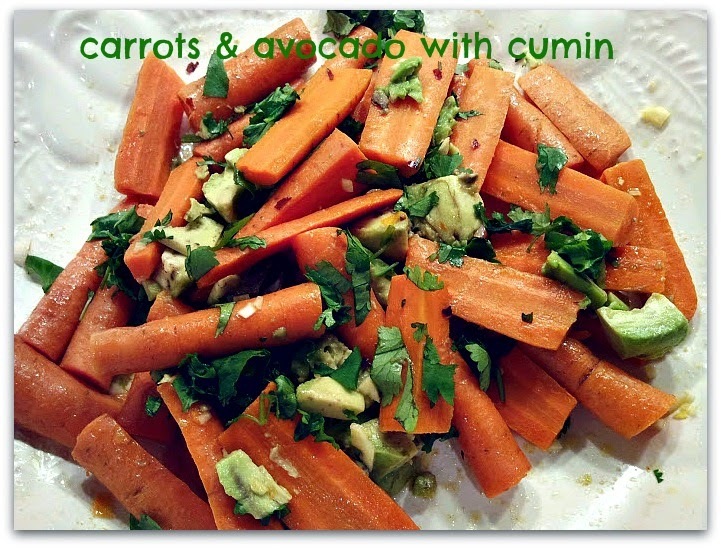 Do you have a favorite carrot recipe? Share in the comments section and/or link to your blog if you have one. Be sure to check out the delicious sounding recipes from my blogger friends and from Food Network.